We are going to do a very large survey today. Up until now we have focused somewhat narrowly on the Hebrew and Greek versions of scripture – and mostly in the immediate Mediterranean regions from northern Egypt over to slightly east of Israel and up into southern Europe and present day Greece and Turkey. 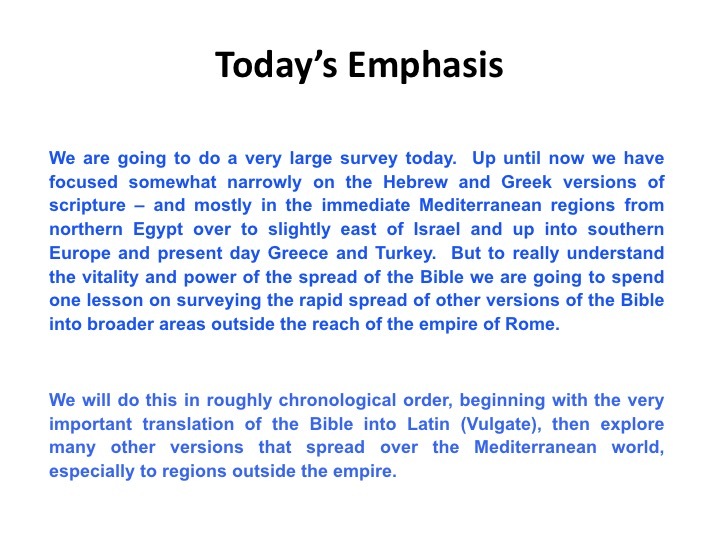 But to really understand the vitality and power of the spread of the Bible we are going to spend one lesson on surveying the rapid spread of other versions of the Bible into broader areas outside the reach of the empire of Rome. We will do this in stepwise. 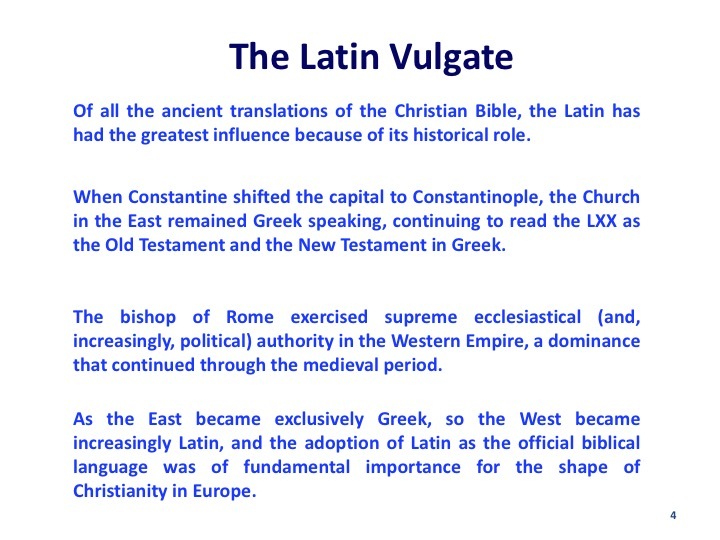 Not necessarily in chronological order, we will first review the very important translation of the Bible into Latin (Vulgate), then explore early many other versions that spread over the Mediterranean world, especially to regions outside the empire. This is a map of the world as it was known then around the Mediterranean. I have created it as a linguistic map rather than a political map. And yes, the Bible was translated in to every one of them in a relatively short period of time. We are going to talk about everyone of these languages - and the remarkable fact that they all appeared despite the difficulty of writing and copying. But even more amazing is that at the beginning of the early church most of these languages did not yet have an alphabet. It was in fact the desire to have the texts of the Bible that let to the creationof alphabets in most of these places. I actually, if I don’t run out of time, intend to talk about each one of them, but only briefly. I will say this again at the end of the lesson, but except for the Latin, none of these had the Imperial Sponsorship I talked about last week. And it is a testimony to the power of the Bible, and early Christianity, that all of this happened. Of all the ancient translations of the Christian Bible, the Latin has had the greatest influence because of its historical role. When Constantine shifted the capital to Constantinople, the Church in the East remained Greek speaking, continuing to read the LXX as the Old Testament and the New Testament in Greek. The bishop of Rome exercised supreme ecclesiastical (and, increasingly, political) authority in the Western Empire, a dominance that continued through the medieval period. As the East became exclusively Greek, so the West became increasingly Latin, and the adoption of Latin as the official biblical language was of fundamental importance for the shape of Christianity in Europe. Latin is the ancestral language of Rome and had already developed a great literature during the time of the republic and early empire (with the writings of Cicero, Caesar, Virgil, Horace, and others). During the first centuries of the Christian era, however, it was the second language of the empire; Greek was the first. The names of all the first Roman bishops are also Greek rather than Latin, and as late as 230, we find Christian authors in Rome writing in Greek (Justin, Hippolytus). Rome had many military colonies in North Africa, which would use Latin more than Greek, and had many Roman merchants whose language was Latin. 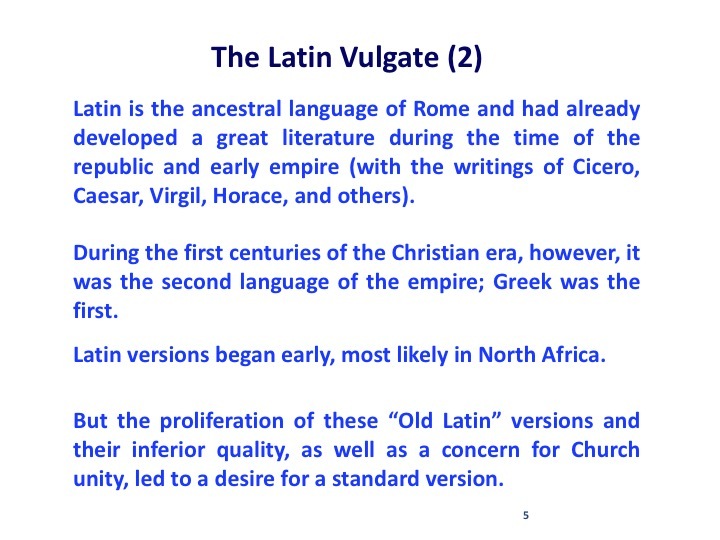 But the proliferation of these “Old Latin” versions and their inferior quality, as well as a concern for Church unity, led to a desire for a standard version. In response to these concerns, Pope Damasus, assigned his secretary, Jerome of Aquileia (c. 342 - 420), the task of translating the Bible into a standard version. After his baptism as an adult, he committed himself to asceticism and ended his days as leader of a monastery in Bethlehem. He was a superb linguist, thoroughly versed in Latin and Greek, and he learned Hebrew when living as a hermit in Syria; he also consulted with rabbis in Palestine concerning the meaning of the Hebrew texts. Jerome began with a revision of the Gospels in 382-384, using an excellent manuscript of the Greek text. The translation of the Old Testament began with the Psalms, based on the LXX, the Gallican Psalter. Jerome increasingly became convinced that the Hebrew text was superior to the LXX and began a fresh translation independent of the LXX. 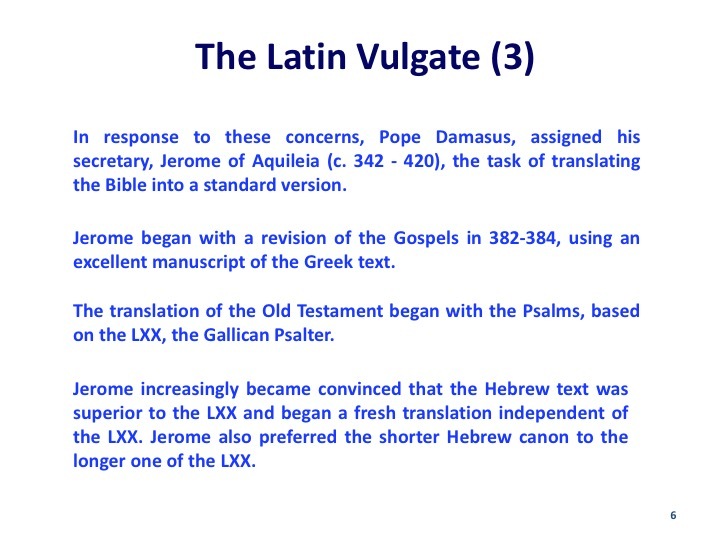 Jerome also preferred the shorter Hebrew canon to the longer one of the LXX. On his on, Jerome eventually decided to drop the LXX and translate the Old Testament from the Hebrew. Augustine complained to Jerome concerning the abandonment of the LXX for theological and pastoral reasons. Jerome's translation took some time to become standard, but by the 6th century it was in universal use in the church, and was “The Bible” in the western church from the 6th to the 16th century. Jerome's translation won its way through ecclesial approbation to be sure, but especially through its intrinsic excellence. Jerome was simply an amazing translator. 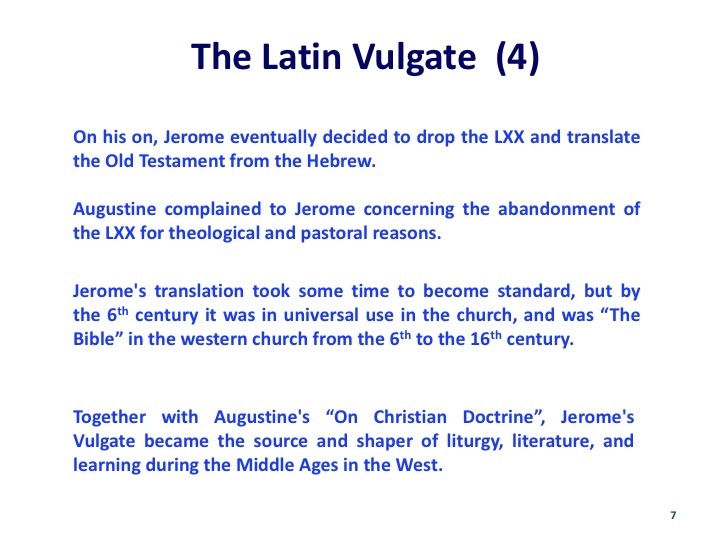 Together with Augustine's “On Christian Doctrine”, Jerome's Vulgate became the source and shaper of liturgy, literature, and learning during the Middle Ages in the West. The study of the early versions (translations) of the Christian Bible is useful in several ways. Adiabene was another center (east of the Tigris) that was Christian by the early 2nd century; evangelization also took place in the countryside. The New Testament relates how Christianity came to Antioch, a center of Hellenistic culture, but does not say how the good news spread to East Syria. 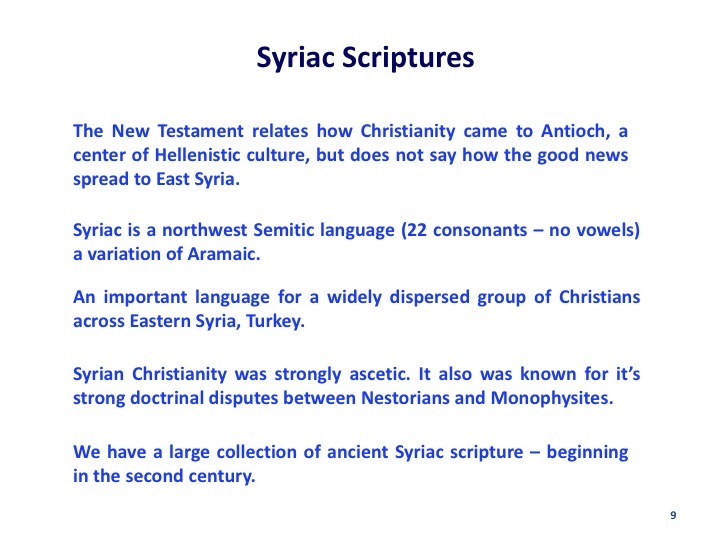 Syriac is a northwest Semitic language (22 consonants – no vowels) a variation of Aramaic. An important language for a widely dispersed group of Christians across Eastern Syria, Turkey. And as we will soon see, became an important language for the further translations of other bibles. Syrian Christianity was strongly ascetic. It also was known for it’s strong doctrinal disputes between Nestorians and Monophysites. We have a large collection of ancient Syriac scripture – beginning in the second century. As in the case of Antioch in Syria, Christianity is best known in its Hellenistic guise in the city of Alexandria, which produced some of the greatest early Christian theology in such figures as Clement and Origen. The native population of Egypt, however, especially in Upper Egypt, spoke the Coptic language. 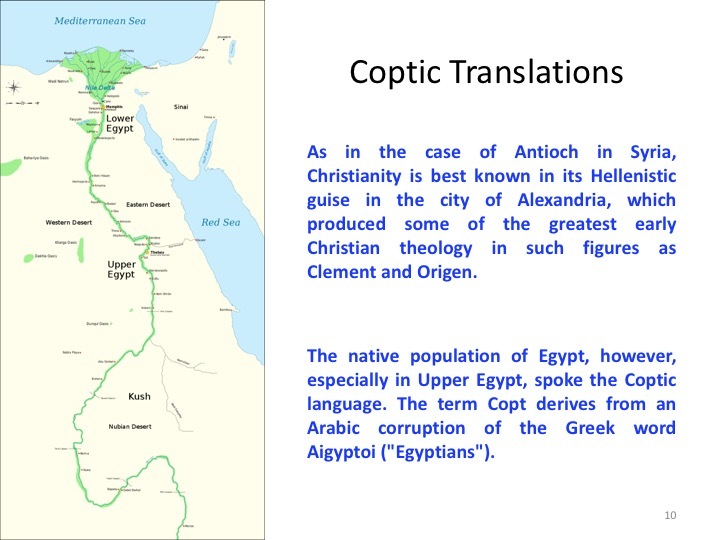 The term Copt derives from an Arabic corruption of the Greek word Aigyptoi ("Egyptians"). In both Syriac and Coptic, an extensive Christian literature developed on the basis of and in concert with the production of the Bible in these languages. 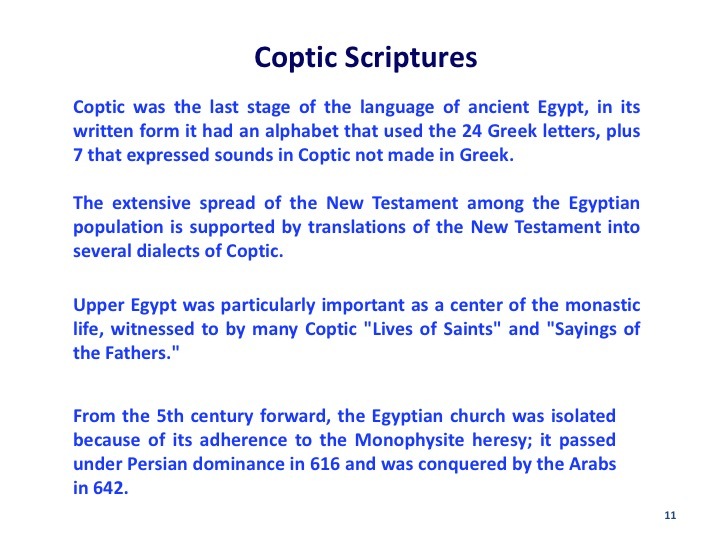 Coptic was the last stage of the language of ancient Egypt, in its written form it had an alphabet that used the 24 Greek letters, plus 7 that expressed sounds in Coptic not made in Greek. 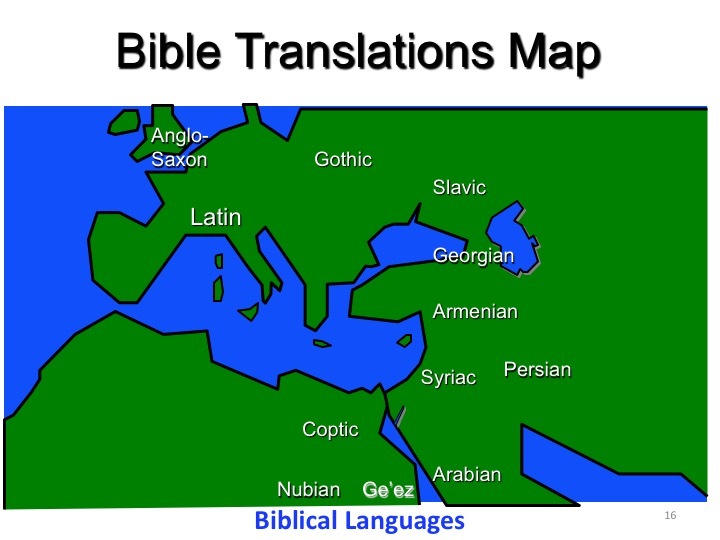 The extensive spread of the New Testament among the Egyptian population is supported by translations of the New Testament into several dialects of Coptic. Upper Egypt was particularly important as a center of the monastic life, witnessed to by many Coptic "Lives of Saints" and "Sayings of the Fathers." From the 5th century forward, the Egyptian church was isolated because of its adherence to the Monophysite heresy; it passed under Persian dominance in 616 and was conquered by the Arabs in 642. 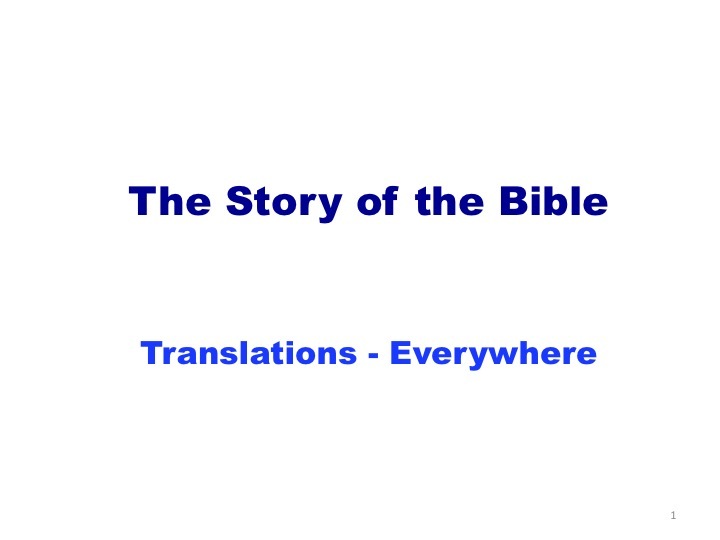 Other major and minor translations of the Christian Bible show how the story of the Bible became part of the history of diverse populations. F or some, the writing of the Bible was the start of a written language and of an ethnic literature. 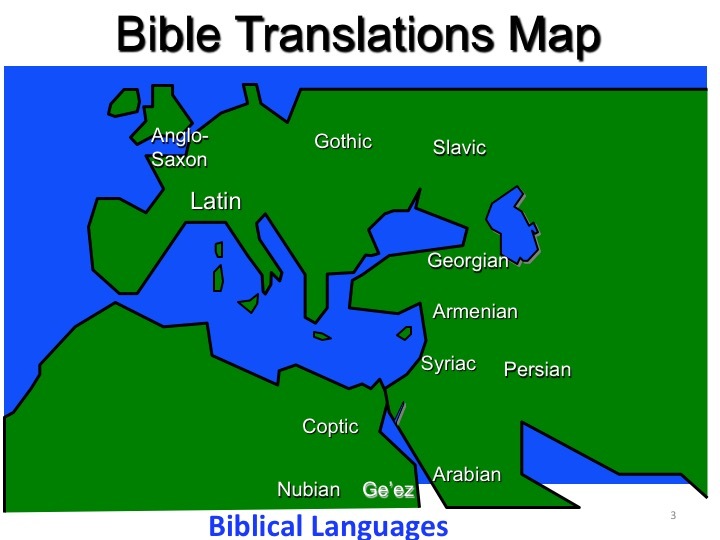 In the East, three other versions of the Bible have a special significance: the Armenian, Georgian, and Ethiopian. The ancient realm of Armenia was the first kingdom to officially welcome Christianity. Gregory the Illuminator (240-332) baptized King Tiridates III around 300 C.E., and Christianity was made the state religion. 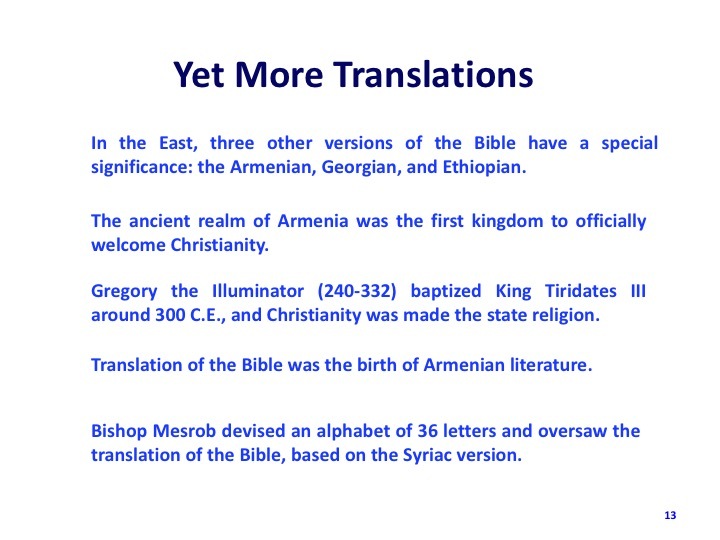 Translation of the Bible was the birth of Armenian literature. Bishop Mesrob devised an alphabet of 36 letters and oversaw the translation of the Bible, based on the Syriac version. Armenian Old Testament includes the “History of Joseph and Aseneth” and the “Testaments of the Twelve Patriarchs”. 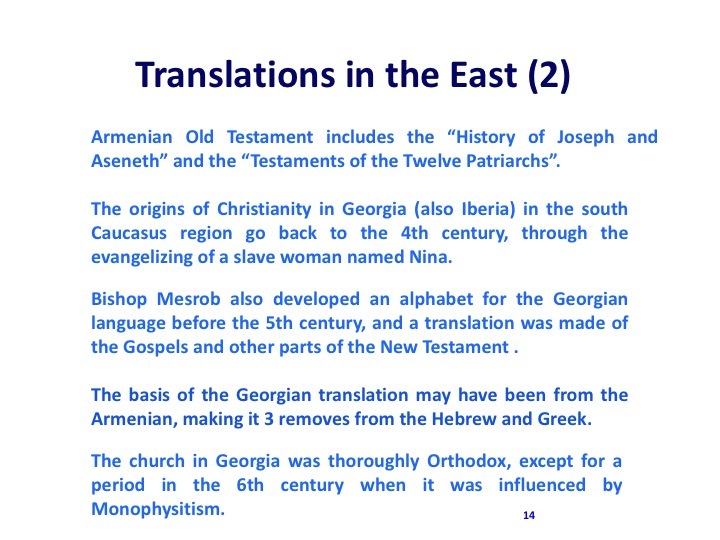 The origins of Christianity in Georgia (also Iberia) in the south Caucasus region go back to the 4th century, through the evangelizing of a slave woman named Nina. Bishop Mesrob also developed an alphabet for the Georgian language before the 5th century, and a translation was made of the Gospels and other parts of the New Testament. The basis of the Georgian translation may have been from the Armenian, making it 3 removes from the Hebrew and Greek. while the New Testament adds the (spurious) Epistle of the Corinthians to Paul and the (spurious) Third Corinthians; some 1,244 manuscripts of the Armenian New Testament are extant. The church in Georgia was thoroughly Orthodox, except for a period in the 6th century when it was influenced by Monophysitism. 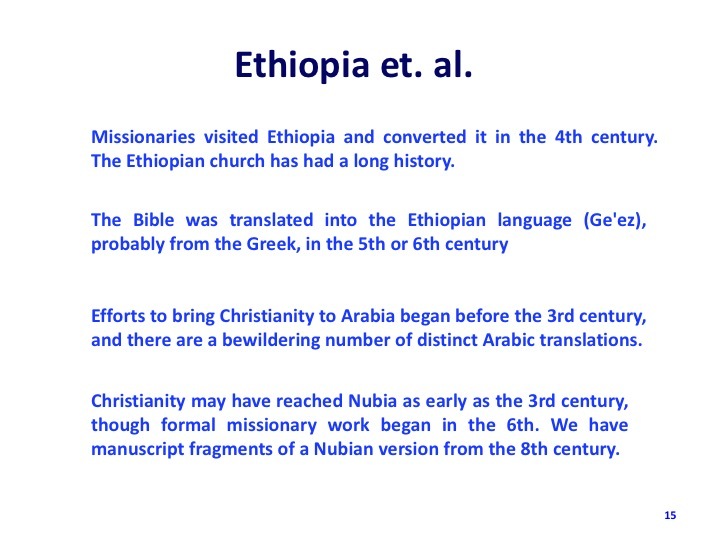 Missionaries visited Ethiopia and converted it in the 4th century. The Ethiopian church has had a long history. Efforts to bring Christianity to Arabia began before the 3rd century, and there are a bewildering number of distinct Arabic translations. 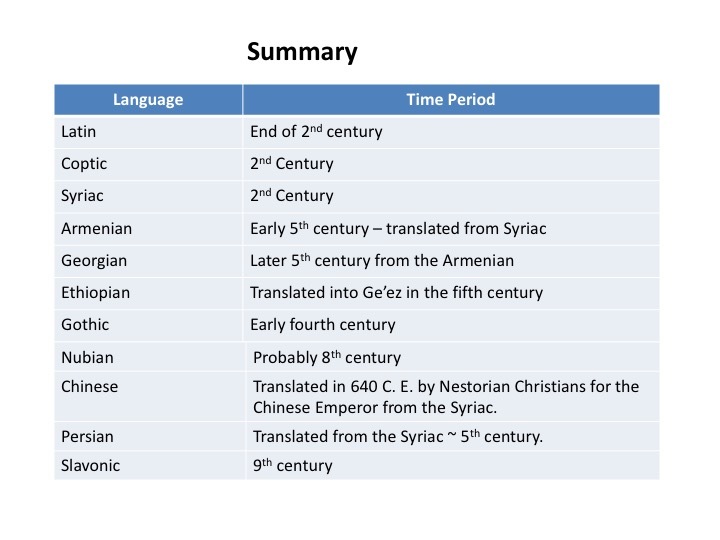 In East Turkestan and Central Asia, the Sogdian language was used as a lingua ji'anca for Central Asia in the way Greek was in the West, and fragments of a Sogdian translation ofthe New Testament have been found, probably dependent on the Syriac. There are traditions stating that Bishop Mesrob also created an alphabet for the Albanians (present-day Azerbaijan), and a Bishop Jeremiah was reputed to have translated the Bible into that language, but no textual evidence of such a translation is extant . Christianity may have reached Nubia as early as the 3rd century, though formal missionary work began in the 6th. We have manuscript fragments of a Nubian version from the 8th century. The importance of the establishment of a Christian community in Persia is more evident when you look at the major trade routes in this part of the world in those times. 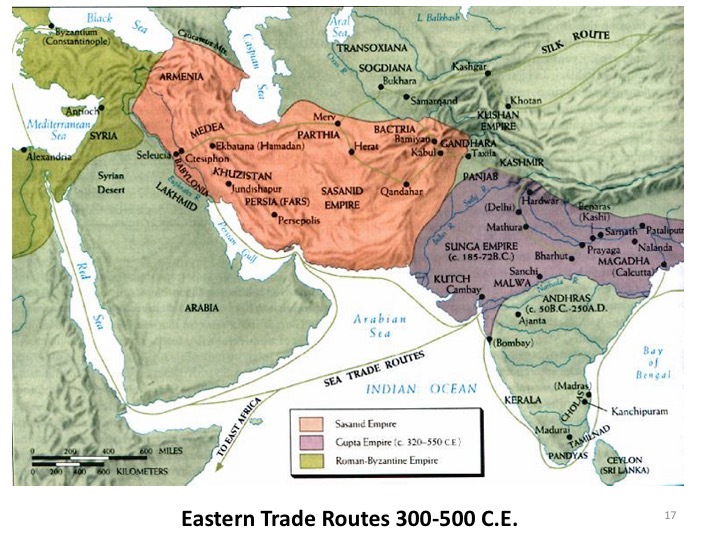 Trade traffic to the east went through Persia, and the Bible and Christianity traveled quickly along trade routes. A vibrant Christianity was established first in India, but as you can see the great Silk Road trade route traveled out of Persia and all the way to China. Nestorian Christianity became well established in China from the 7th to the 12th century before coming under persecution. But well before that the Chinese emperor asked the Nestorian Christians for a translation of the Bible into Chinese. 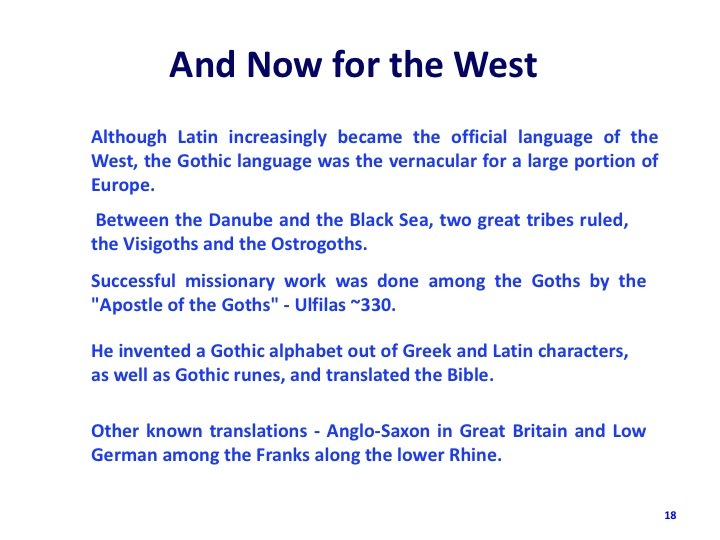 That was done in 640 C. E.
Although Latin increasingly became the official language of the West, the Gothic language was the vernacular for a large portion of Europe. Between the Danube and the Black Sea, two great tribes ruled, the Visigoths and the Ostrogoths. Successful missionary work was done among the Goths by the "Apostle of the Goths" - Ulfilas ~330. He invented a Gothic alphabet out of Greek and Latin characters, as well as Gothic runes, and translated the Bible. Other known translations - Anglo-Saxon in Great Britain and Low German among the Franks along the lower Rhine. They were both highly educated, and were monks of the Eastern Orthodox church. In 860–861, the brothers went on a diplomatic mission to the Khazars (north of the Caucasus) and, while there, learned the Slavic language, which importantly, as yet existed only in speech, not in writing. Cyril then decided that the Slavic languages needed an alphabet so that Christianity could be spread through Bible written in Slavic tongues. Cyril invented the Glagolithic alphabet, which became the medium for the translation of the Bible into Slavic and the development of a substantial ecclesiastical literature in Slavic. The Cryllic alphabet, a modification of the Glagolithic, is the basis of alphabets used in various languages, past and present, in parts of Southeastern Europe and Northern Eurasia, especially those of Slavic origin, and even in non-Slavic languages influenced by Russian. As of 2011, around 252 million people in Eurasia use it as the official alphabet for their national languages. About half of them are in Russia. Cyrillic is one of the most-used writing systems in the world. 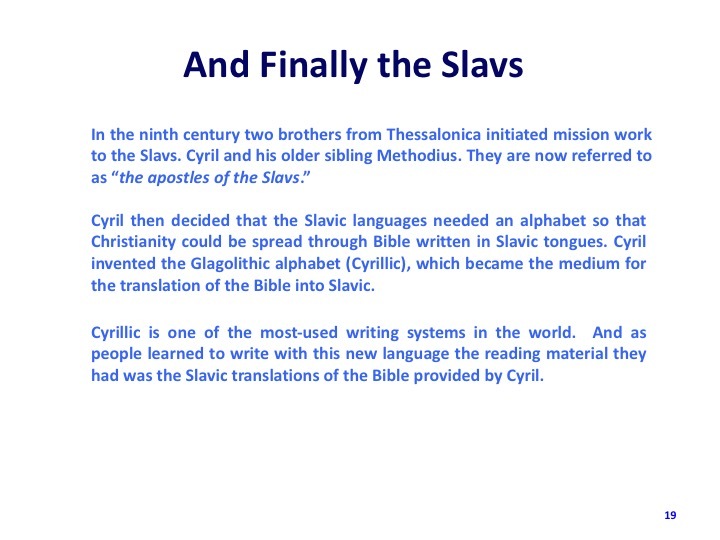 And as people learned to write with this new language the reading material they had was the Slavic translations of the Bible provided by Cyril. Thus the Slavic people were often exposed to Christianity exclusively through the church's established in the East (Constantinople being the first). There was little competition from other religions. Saint Cyril is now a saint of the Eastern Orthodox churches. Thus a summary of all of the Biblical translations we covered today. A most impressive list. 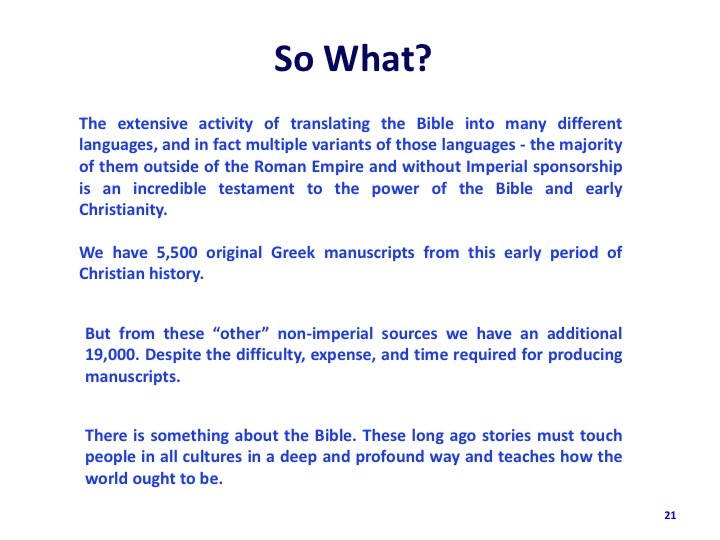 The extensive activity of translating the Bible into many different languages, and in fact multiple variants of those languages - the majority of them outside of the Roman Empire and without Imperial sponsorship is an incredible testament to the power of the Bible and early Christianity. We have 5,500 original Greek manuscripts from this early period of Christian history. But from these “other” non-imperial sources we have an additional 19,000. Despite the difficulty, expense, and time required for producing manuscripts. There is something about the Bible. These long ago stories must touch people in all cultures in a deep and profound way and teaches how the world ought to be.